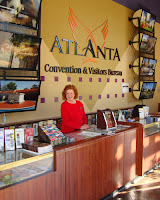 The day I visited the Visitor Center in the Atlanta Convention & Visitors Bureau turned out a lot better than it began. My first-choice tour destination for this particular day, which I'd been meaning to visit for a couple of weeks, was not offering tours because they were filming. I wish I had asked what film. Actually, lots of Hollywood movies are filmed in the Atlanta area, including the Oscar-winning The Blind Side and Fried Green Tomatoes…and I'm a huge cinema enthusiast. I tried a second destination, but it was too early to catch its lively hustle and bustle, so in fairness to that site, I decided that I'll return another time to garner the words to describe its festive nightlife. 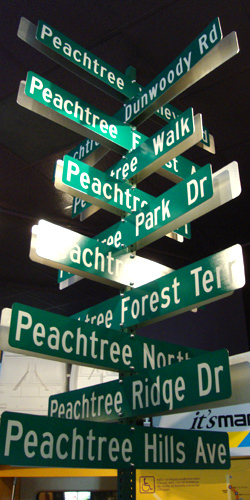 While in the downtown area (and out of curiosity), I ventured into the Atlanta Visitor Center, part of the Atlanta Convention & Visitors Bureau and found a treasure trove of future tour and event possibilities. I know Atlanta quite well, but this place is opening up a lot of new doors. Serendipity at its finest, I was in the right place at the right time and received exactly what I was looking for—the best city tour I've been on in years. Fortunately for visitors, the same tour is regularly available via ATL-Cruzers. The Atlanta Convention & Visitors Bureau is a mega-win for locals and tourists alike, as well as event planners, meeting planners, conventioneers…basically anyone who is looking for even a sliver of what Atlanta has to offer. For this installment I'm going to focus on what's available for visitors, or I'll end up writing a record-length blog post…there's really that much! I'd actually forgotten where the Visitor Center is, so when I happened upon it, I was excited to learn what it had to offer. When you're looking for it, keep an eye out for the purple awnings…when you see those, you're there. As soon as I walked in the door, I was greeted with smile and handshake by Mary Ann. She very charmingly offered to assist me, but I returned an "I'm just looking around." After several minutes at one of the information stations and a handful of pamphlets later, I realized that there was a lot more to this place than most visitor centers. I started talking with Mary Ann again, told her about my morning misfortune of a tour being preempted by a film crew. She very keenly picked up on the fact that I am indeed a tourism enthusiast and I also shared that I author "tourATLANTA." Matching my excitement of the newly discovered fountain of information, Mary Ann toured me around the Visitor Center and introduced me to others who were working there, including the managers of the ATL-Cruzers (the city tour company) and AtlanTIX. Stephen, the manager of ATL-Cruzers, was quite pleasant upon introduction, as well as professional and enthusiastic. When he noticed that my tour with Mary Ann was near conclusion, he offered to take me on a city tour. Anxious to explore, I graciously accepted the offer and in a matter of minutes we were off to see historic downtown and midtown Atlanta. The tours are conducted in brand new, sleek, modern, eco-friendly electric cars that seat six people...the tour guide and five guests. They're much more intimate than the people-mover tour buses I've been on before. The tour vehicles are quite comfortable. Although modern, they don't make you feel like George Jetson time-traveling through historic Atlanta. You actually feel like you're visiting a friend who just happens to be telling you about a magical land that rose from the ashes that has a rich history and exciting people. My expectations were incredibly surpassed. The abbreviated version of the tour that I was treated to was super-packed with information and I learned a lot about my home town…the kind of information that I think a visitor would find quite fascinating. 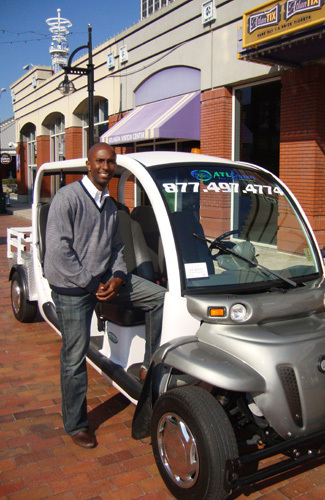 When I have visitors in town that I can't cart around for whatever reason, I will definitely send them to ATL-Cruzers. Actually, I will likely do the same even if I do have time…the tour is that good. 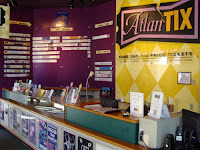 I've been to TKTS in Times Square in New York City and to the Ticket Place in Washington, D.C., but I had not yet discovered Atlanta's half-price ticket venue, AtlanTIX, which is part of Atlanta Performs. I met Marc, the manager of AtlanTIX, who was very nice and explained how the same-day, half-price ticketing works and that tickets are available for a wide range of performances, attractions and events. I actually returned the very next day to buy tickets to Synchronicity Theatre's production of "The Storytelling Ability of a Boy," which was performed at 7 Stages Theatre. The performance was heart-pounding and the venue is very much in tune with its neighborhood, Little Five Points. The Visitor Center is considerably larger than what I expected. 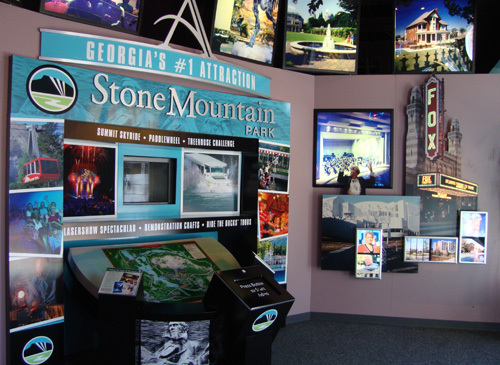 Similar to an actual museum, the Center has an array of exhibits featuring Atlanta's most popular attractions (Stone Mountain Park, Georgia Aquarium, the Fox Theatre, and others). 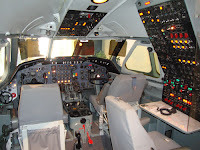 They even have a cockpit of a Delta airplane! Additionally, there are photographs and artifacts that share tidbits about Atlanta's vibrant history…but not so much that it keeps you from wanting to immediately head out to explore the city—very well done, I think. Will I return to the Atlanta Convention & Visitors Bureau? I gave the answer away telling you about returning the next day to buy tickets to performance. This place is a cornucopia of tourist information, great ticket deals and the tours are the best! I'm looking forward to going back, with great anticipation, to see what's new. Hours: Monday-Saturday 10 a.m. – 6 p.m., Sunday 12 p.m. – 6 p.m.